Lebanon on Saturday was without a government after the surprise resignation of premier Najib Mikati and as it battled deep divisions fuelled by the civil war in neighbouring Syria. The head of the government in which the Shiite movement Hezbollah, a key ally of Damascus, holds powerful sway, formally submitted its resignation on Saturday to President Michel Sleiman who asked that it continue in a caretaker capacity. 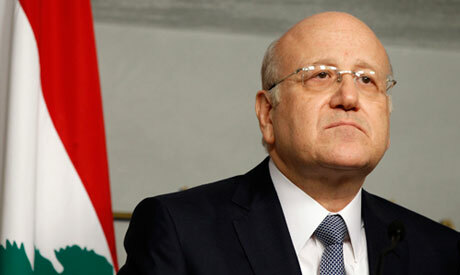 Mikati announced his government's resignation late on Friday, citing divisions on several domestic issues, and called for a national unity government. "I announce the resignation of the government, hoping that this will open the way for the major political blocs to take responsibility and come together to bring Lebanon out of the unknown," Mikati said. He called for the "formation of a national salvation government in which all Lebanese political forces are represented in order to save the nation and deal with regional developments with a collective spirit of responsibility." Mikati became prime minister in 2011, positioning himself as a moderate. He headed a government dominated by the so-called March 8 coalition, made up of Hezbollah and its allies, and drew fire from Sunnis who accused him of betraying his community and siding with the Syria- and Iran-backed group. Although the government had officially adopted a policy of "disassociation" from the Syrian conflict, Syria is probably the real reason why it has fallen. Until 2005, Lebanon was dominated politically and militarily by Damascus. Mikati's government was constantly criticised by the March 14 movement led by former premier Saad Hariri, an opponent of President Bashar al-Assad's regime, and his Christian partners from the Lebanese Forces of Samir Geagea. Mikati's decision to step down came after disagreements on two domestic issues -- an elections supervisory commission and extending a security chief's mandate. The 57-year-old was involved in a contentious bid to extend the term of the Sunni head of Lebanon's Internal Security Forces, General Ashraf Rifi, which was opposed by a majority of the government. "In a few days a major security institution risks falling into the void when its director general retires. I felt that during this sensitive period that he should stay in office... but I found that the council of ministers does not share my opinion on this," he said in announcing his resignation. Rifi, a Sunni and opponent of Syria, was a thorn in Hezbollah's side. His officers were involved in the investigation that led to the indictment by the International Criminal Court of four Hezbollah members for their alleged role in the murder of former premier Rafiq Hariri in 2005. Two pro-Syrian newspapers, Al-Akhbar and As-Safir, reported on Saturday that Mikati had sent a message to Hassan Nasrallah, head of Hezbollah, warning that he would resign if his movement did not accept Rifi staying on. Nasrallah reportedly replied: "Do what you think is best." Another bone of contention was Mikati's insistence on holding an election in June but before a move by Christian parties to change an electoral law that they feel is detrimental to their community. The daily Al-Nahar, close to the opposition that is hostile to Damascus, expected a "protracted crisis," while Al-Akhbar on the opposite of the political divide said Mikati's resignation "means the end of the policy of disassociation." "This resignation plan can expect to have security repercussions not only on the border with Syria, but also within Lebanon. The political chaos will last a long time," it said. On Saturday, fresh sectarian clashes erupted in the flashpoint northern city of Tripoli, killing one Alawite, and wounding an ALawite and a Sunni, a security source said. Intermittent battles pit Alawites belonging to the same sect as Syria's Assad against Sunnis, who back Syria's insurgents. EU foreign policy chief Catherine Ashton voiced concern at the "deteriorating situation" in Lebanon, while UN chief Ban Ki-Moon called on the Lebanese to unite and maintain their policy of "disassociation" from the Syrian conflict.